Having for many years felt desirous to open a corresponding communication with some intelligent branch of my kindred in France, that anxious desire has in a great measure been satisfied by the discovery now made under the influence of the British Consul at Rouen. A desire similar to this had often occupied the mind of my grandfather, Sir James Garvey, but want of satisfactory information placed an interdict upon all these resolutions and consequently all ultimately fell to the ground. I would now beg to intimate you that my object in this address is to, if possible, learn from you if in your memory you can recollect any mention by your forefathers of their kindred residing in Ireland, and in that country being possessed of an estate bearing the name of Aughnagun. If such can be borne in mind by you, the sequel of the enquiry may be easily accomplished. Many years ago, two gentlemen of our family came from France to Aughnagun aforesaid. I am not aware of the fact, nor otherwise, but perhaps these gentlemen might be interested in that estate, but be that as it may. My late grandfather before named was a man of easy and confidential habits and belief, and that fact was well known to be his characteristic throughout the country. And by and from these simple habits, two men in the neighbourhood named Develin and Murphy did absent themselves from the environs of Aughnagun aforesaid ; and upon their return to it, publicly announced that they had been in France, and that they had purchased the interests of the Garvey family residing there. And at the same time, these fraudulent men had got deeds forged to ensure their purpose. And as equiped, they returned to Aughnagun aforesaid, announcing that that estate was theirs by purchase from the French (members) of the Garvey family. And from that day to the present hour, the said Develin and Murphy have held their prerogative over the ancient estates of our progenitors. My dear Sir, it has recently been made manifest that this was the work of premeditated combination as a fraudulent trespass up (to) my grandfather‘s simplicity, as him only, and the most Reverend Father in God Anthony Garvey, Catholic Archbishop of Newry, were the only persons in Ireland in their day that could (claim the estates) of Aughnagun. It is now most humbly requested that you (call up your mind and tell me if you have heard anyone) of your family name the estates mentioned as often in this statement, or if ever the names of Develin or Murphy was known to be any time inserted in any manuscript in the possession of any of the Garvey family in Rouen or elsewhere in France. I request that you will at your leisure consider of this case and be so kind as to give me an answer as you shall be enabled from examination. Accept my best wishes and convey the same to your family and kindred. My husband, Mr Thomas Mc Manus, is a merchant and I hold the situation of governess of the Institution in which I reside. I was away when your letter reached Rouen. I hasten to answer it today. 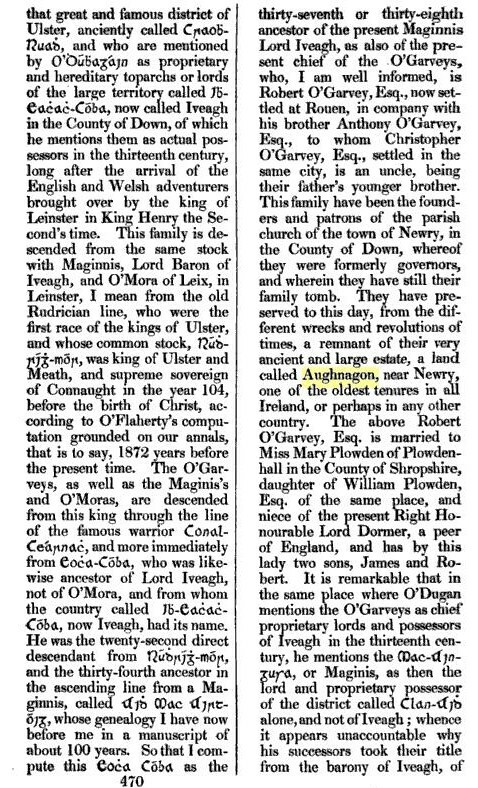 The estate of Aughnagon which was my father’s property (being the eldest in his family) was in fact sold by him in 1803 to MessrsDevlin and Murphy who then became the legitimate owners of the estate. That is what I can certify to you. As regards your grandfather, I vainly searched for his name in our genealogy. I found no trace of it. I must come to the conclusion that if we belong to the same family, we are very remotely related. I never heard of any other family bearing our name in France. Below, Mrs McManus wrote the letter but we still do not know why, her husband may have been related, Thomas McManus was a tailor in Newry. However, Catherine Murphy Marmion's father Laurence Marmion went to Rouen France with brother in law Mike Devlin to purchase Aughnagon. ..as the Response attests to. till about sixty years ago. Proud his battalion when marching. They have taken all Uladh. They are the treasury of hospitality. Are the props of hard-armed Uladh. Over the red-haired Clann Breassail. "